I'm a huge fan of bolsters! I have a collection of four, all of different shapes and sizes. When I first got them I wasn't quite sure how to use them, so if you're as confused as I was, here are five easy poses to do with a bolster. While in child's pose, prop yourself up with a medium sized bolster to give your upper body more support. If your hips are feeling particularly tight, keeping the chest elevated is a great way to make this post more restorative. Supported fish is commonly done with the help of two blocks, but I find the edges can be harsh and uncomfrtoable along the spine. A nice bolster placed behind you to support your spine is a really comfortable way to explore this heart opening pose. Make sure the bolster isn't sitting too low in your lower back or you might feel tension. I generally like to keep the bolster on my mid back or closer to my shoulder blades. This is another pose where a block is usually used to support the hips. If you plan on being in this pose for an extended period of time as I like to do, the block can be uncomfortable after a while. 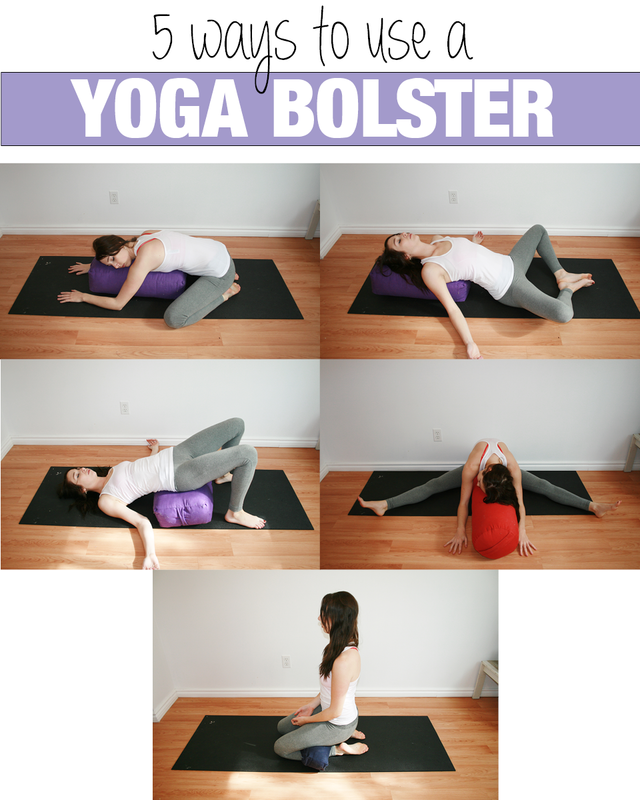 Give your lower back some extra cushioning by using a bolster instead. Place it directly under your tailbone and explore the pose by keeping your knees bent or straightening the legs. I love to do these types of forward folds but it can be tiresome to support yourself with your arms. By allowing your upper body to be supported you can stay in the pose longer and really learn to relax into it. The less tension you can have, the better! If kneeling is uncomfortable for your knees or ankles, a smaller and thinner shaped bolster is a great way to cushion the joints. If I'm in this stance for a meditation I like to place my small bolster between my thighs and calves. Some people also enjoy placing it closer towards the ankles, so feel free to explore and see what works for you.